As Seen In Ghana. Woman Caught On Cam Using Her Saliva To Clean Drinking Glasses In A Beer Parlour! This is terrible. Why on earth would someone use saliva to clean drinking glasses? 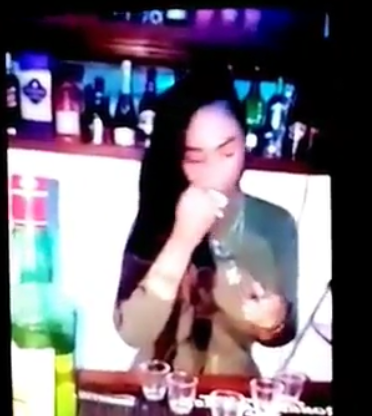 A woman who goes by the Instagram name (micygh) was allegedly caught on camera cleaning tequila glasses with her saliva at Diamond Pub and Grill, East Legon, Ghana. She is said to be the owner of the bar. Folks this isnt about she being a dirty girl oooo she knows exactly what she was doing to those glasses. Shame on u! Share this video folks let it go viral. We aint going into that container pub ever in our lives. Disgraceful swine like u!